At Big Meadow you’ll find a large U.S. Forest Service campground with 73 campsites. The present campground, in what was originally known as Register Flat, is located southwest of the original Big Meadow (Dell’Orto Camp or Thompson Meadow today). Big Meadow encompasses the valley in which Blue Creek and the main fork of Big Meadow Creek originate. The Emigrant Road came down off the ridge from the east and crossed the meadow northeast of the present highway. What was probably the oldest cabin to have been built along the Calaveras route between Dorrington and Bloods Meadow was located at Big Meadow. The cabin had a dirt floor, no windows, but three gun ports, and a front door. By 1878 the location was known as Big Meadow Ranch and was used in the 1890s and early 1900s as the Guishetti Dairy Ranch. A summer home tract was surveyed in 1922, but a resort was never developed. The meadow, coppiced and burned over for hundreds of years by Native Americans, filled in with native conifers after the cattle were removed from grazing. 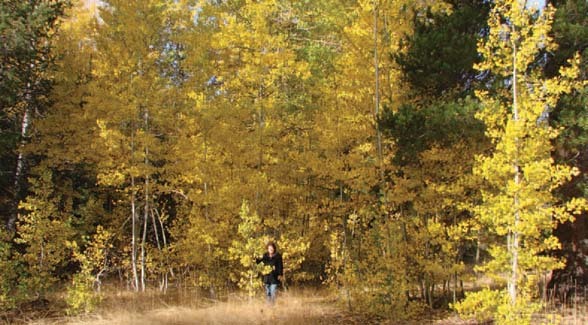 A large grove of mature aspen surrounding the meadow puts on a spectacular display of fall color, and the U.S. Forest Service continues its restoration of the area.